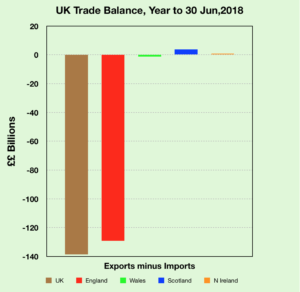 HMRC runs a very handy website called HMRC Trade Info which contains a lot of information about the economy of the UK and its constituent Nations. And yes, I and probably you like it that Scotland is in the black as regards trade. These figures get shared around Yes Supporting social media a lot. And fair enough, because you can bet if Scotland was showing a trade deficit the figures would be given prominence in the Unionist media. It’s good to have this fact to hand. But how useful is it really? For example, my car was one of a batch imported from Leipzig to the south of England in the period covered by these figures. After a couple of weeks, it was transported up to me in Glasgow. Is it classed as an English import? Or a Scottish import? I don’t know. I think it’s very likely that it’s an English import. In which case my car has skewed these figures in Scotland’s favour. But if that’s the case then it must work both ways and some Scottish exports, going via England, are probably being camouflaged amongst the English exports which skews the overall balance against us. HMRC do give details of how they calculate this sort of thing but they admit that anything which goes to a buyer in England who then exports it will be counted as an English export. 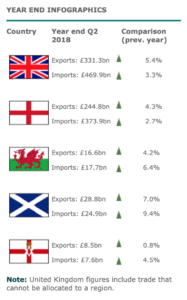 Are Scottish goods which are exported via ports from the rest of the UK counted as international Scottish exports? Yes. The ESS publication measures the destination of goods exported from Scotland regardless of the port from which they leave the UK. How does ESS treat the situation where Scottish goods are initially exported to the rest of the UK, and subsequently re-exported? The ESS estimates only capture the first point of export. This means if a good is exported to a company in the rest of the UK and that company then exports it somewhere else, ESS will only capture the export to the rest of the UK. Direct sales from Scottish companies to international destinations are counted as international exports regardless of where they leave the UK. Probably no-one knows our true trade figures. HMRC do provide a lot of data in the Trade Info website but they are limited by the limitation of the data that’s asked for and passed to them. We need a Scottish Statistics Office. This entry was posted in Economy on 04/12/2018 by MmH.